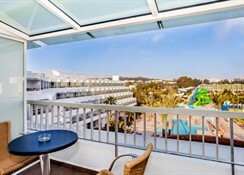 Located opposite a stunning beach in Agadir, the Amadil Beach Hotel offers 280 airy, bright and spacious rooms. 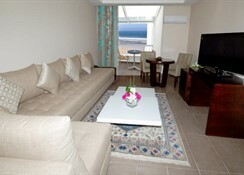 Offering views of the sun, sand and sea as well as the mountains, the accommodation will surely delight guests. 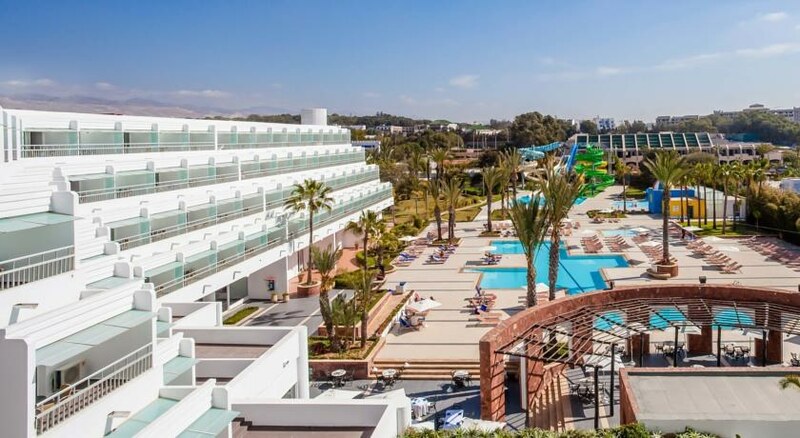 Boasting of its own waterpark with five water slides and a massive freshwater swimming pool, this beach hotel guarantees a fun-filled family holiday in Morocco. The four onsite restaurants, three bars, a lounge and a pool bar take care of the drinking and dining needs of the guests. The restaurants serve a variety of cuisines from around the world. The hotel offers a wide range of activities that include beach volleyball, table tennis, horse riding, and several water-sports. The Amadil Beach Hotel enjoys a stunning beachfront location. The city centre is not too far from the hotel at 3.3km. There are several restaurants, bars and shopping centres close to the hotel. The Agadir Medina is only 5.5km from the hotel. The Agadir International Airport is only 22.3km from the property. With a total of 280 bright and spacious rooms, the Amadil Beach Hotel is one of the best in Agadir. The rooms are categorised as double sea view rooms, triple sea view rooms, double pool view rooms, triple pool view rooms, double garden view rooms and family suites. Amenities and facilities common across all the air-conditioned soundproof rooms include a minibar, a flat-screen TV with satellite channels, a safe, a bathroom with a shower or bath and hairdryer. Some rooms have a private balcony or terrace. Extra cots and cribs are available on request. 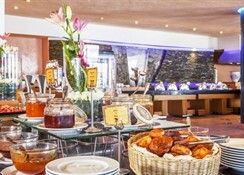 The Amadil Beach Hotel features four onsite restaurants, three bars, a lounge and a pool bar. The restaurants serve a variety of cuisines from around the world as well as local cuisine. At the main restaurant, breakfast is served during 6am and 10am; lunch during 12:30pm and 3pm; dinner is served during 6:30pm and 9:30pm. All meals here are served in buffet style. The other three restaurants are a la carte and serve Moroccan, Italian and Asian cuisines respectively. Located on the beach and housing an aquapark, the Amadil Beach Hotel is perfect to have a fun-filled family vacation in Morocco. The hotel features five water slides and a massive fresh water swimming pool. There are sunbeds dotted around the pool area for you to relax. The poolside bar takes care of your hunger pangs and serves delicious cocktails and tapas. The hotel’s spa offers rejuvenating massages and therapies. Within the hotel complex, there is scope for Aerobics, table tennis, beach volleyball and billiards for an additional charge. This hotel is near perfect! Great location, rooms are comfortable and spacious bedrooms and bathrooms, good breakfasts lunch dinner and probably the most enjoyable i ever had. entertainment was very very good even on the off season.